YouTube sensation Bhuvan Bam and Divya Dutta-starrer Plus Minus won the 2019 Filmfare Award for Best Short Film recently. ▶ Videos for "Filmfare Awards 2019"
Alia Bhatt on declaring love for #RanbirKapoor at Filmfare Awards 2019. Watch what #AliaBhatt has to say. #DeepikaPadukone says sorry to her fans after losing to #AliaBhatt at FILMFARE awards 2019. Watch the video now. #RanbirKapoor and #AliaBhatt share a passionate kiss when Ranbir was called on stage to pick up his Filmfare awards 2019 for Sanju. Filmfare Awards 2019 : #RanbirKapoor and #KatrinaKaif forget past, get back together and their lovely moment got viral. Watch the video. Alia Bhatt's debut in South film industry, #DeepikaPadukone, and #RanveerSingh unveil Wax Statue, Filmfare Awards 2019 nominations are among the Top 10 News in #BollywoodNow Daily Wrap. #RanveerSingh at the press conference of Filmfare Awards 2019, shared with the media about his meeting with Prime Minister Modi. He also spoke about his upcoming film #83. Rishi Kapoor has reacted Ranbir Kapoor's big win for Sanju at the recently held Filmfare Awards 2019. Deepika Padukone was nominated for Best Actress for her act in Padmaavat at Filmfare Awards 2019. She lost the award to Alia Bhatt for her role in Raazi. In the last decade, three women have won the Filmfare award for Best Director - Zoya Akhtar for Zindagi Na Milegi Dobara (2011), Ashwini Iyer Tiwari for Bareilly Ki Barfi (2017) and Meghna Gulzar for.. While there were a lot of head-turners at the Filmfare Awards 2019, a few missed the memo! Filmfare Awards 2019 was a LIT affair, thanks to these ladies! Vimal Elaichi Filmfare Awards 2019 saw who's who from the industry under the same roof. Deepika Padukone, Sara Ali Khan, Ranveer Singh, Alia Bhatt, Ranbir Kapoor, Karan Johar and many more came.. Recently, the BFFs met at the 64th Vimal Elaichi Filmfare Awards 2019 and shared a selfie moment together and their fans just cannot get enough of them. DP shares an adorable pic of her "favourites"
The 64th Vimal Elaichi Filmfare Awards 2019 was a star-studded affair. The whole Bollywood attended the award night in their best attire. 64th Vimal Elaichi Filmfare Awards 2019 witnessed a galaxy of Bollywood stars and they put forth their best look at the event. The night was filled with energetic performances and emotional speeches. Meghna Gulzar's 'Raazi' bagged the top honour at the 64th Vimal Elaichi Filmfare Awards 2019. At the prestigious 64th Vimal Elaichi Filmfare Awards 2019, Hema Malini's contribution was honoured with a Lifetime Achievement Award. Here's a look at all the stylish celebs spotted at the Vimal Elaichi Filmfare Awards 2019. 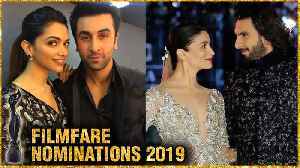 From who's coming to who's winning what, catch all the action from Filmfare Awards 2019 here! Just like we've come to witness over the years, Filmfare Awards night will see some of Bollywood's biggest stars come together to celebrate the industry. Members from all quarters of Bollywood got together to honour the best of Hindi cinema in 2018 at Jio Garden, Mumbai on 23rd March 2019 for the 64th Vimal Elaichi Filmfare Awards 2019. The wait for the 64th Vimal Elaichi Filmfare Awards 2019 is finally over. The award function will witness the biggest names of Hindi cinema. And everyone is waiting to know who takes home the black..
Vicky Kaushal is all set to give his first ever performance at the Vimal Filmfare Awards 2019. As much as the fans are waiting to see their national crush putting the stage on fire, Vicky Kaushal..
Filmfare Awards 2019 have been threatened with strict action by the US' Food and Drug Administration over a tobacco brand sponsoring the event. 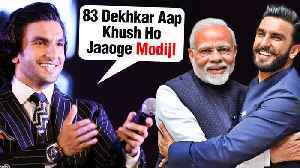 The 49-year-old actor's tweet comes after the nomination list for the 64th Vimal Filmfare Awards 2019 were announced on Tuesday. 2018 gems like Manto, Pataakha and Tumbbad have been nominated for Best Film - Critics' Choice at the Filmfare Awards this year. The wait for the official nominations' list for the 64th Vimal Filmfare Awards 2019 is finally over. The award function will be held on 23rd March 2019 and will witness the biggest names of Hindi..
Ranveer Singh who attended the inaugural ceremony of 64th Vimal Filmfare Awards 2019 to announce the official date of the award night. The coveted Black lady is up for grabs once again as the star of the millennium, Ranveer Singh announced the launch of the 64th Vimal Filmfare Awards 2019, at a conference held in Mumbai.